Collecting and centralizing competitive intelligence data can be time-consuming and overwhelming. Escape the frantic search for your competitive information and develop a more holistic understanding of your market and your competition. 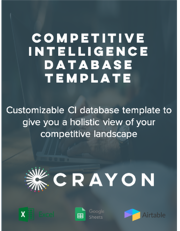 This template, which is available in three formats (Excel, Google Sheets, and Airtable,) will allow you to fill in the blanks with your competitive intelligence data, and build better sales enablement tools for your team.